and surgery facility is located right here. “George” a German shorthair, trained hunting dog, was only a little more than a year old – with the promise of a decade of hunting adventures to be forged with his owner – when he came up limping one day. Lindstrom veterinarian Dr. Pete Lukasik said he knew immediately it was s serious injury. The dog’s cranial cruciate ligament (see graphic below) was damaged. Not long ago this injury could have put an end to George’s ability to hunt and enjoy life as the energetic animal he was meant to be. But thanks to advances in veterinary medicine and developments in bio-implants, George is quickly returning to his former self. In the past this injury would have been repaired using a procedure called imbrication, utilizing a fishing-line type of material. And, this is still used on little dogs (less than 25 pounds) whose reduced weight doesn’t stress the ligament repair; or on old dogs who frankly don’t need a surgical replacement to last a long time. The ligament injury was bad luck. The good luck was that Lukasik recently trained with another surgeon and became proficient in a new surgical repair called TTA. Developed in Switzerland this procedure was only brought to the U.S. two years ago. Lukasik had no problem convincing George’s owner to go for the TTA. George is Lukasik’s dog. Image shows location of torn ligament. The meniscus tissue is the wide horizontal band below the joint that can suffer unnecessary damage when an injury is ignored. Lukasik said, “…recovery can be challenging” in dogs who undergo the TTA and feel better and want to run around again too soon. “You have to keep the dog quiet for several weeks,” Lukasik explained. Being able to follow his own dog’s daily post-operative progress was a terrific opportunity for the veterinarian. He charted the repair closely using x-ray and radiograph. Lukasik is one of just four doctors performing TTA surgeries in this region. He was introduced to the surgery by Dr. Jeff Mayo, who was by Lukasik’s side in the operating room overseeing and training him in this procedure twice. Mayo is from Seattle, Washington. Lukasik says the success of this procedure is two-fold. The titanium plates that are implanted are custom sized to the dog and are designed for this use. The second factor is that the procedure modifies the slope of the tibial plateau which decreases the “thrust” or pressure on the joint. Lukasik said, “The dog’s knee is stabilized” so auxiliary damage that can occur, like meniscus tissue injury, doesn’t happen. “This is a huge improvement over what was offered before,” Lukasik added. “It’s very rewarding to be able to offer this to my patients. People who are not going to hesitate to do this might have thousands of dollars invested into their dog and his training,” he added. While Lukasik can’t claim to be a specialist (which requires Board certifications), his Lakes Veterinary practice houses advanced surgery equipment and he performs dental and laser-assisted surgeries not generally available. “Dr. 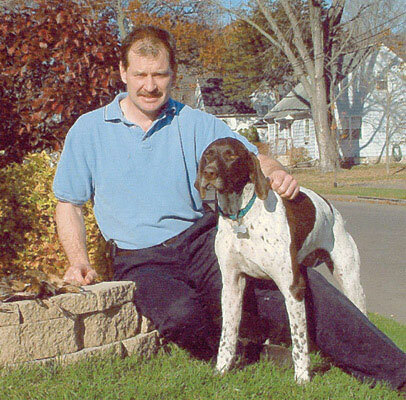 Pete” has been practicing veterinary science for 19 years in Lindstrom. One final word for pet owners – if your animal appears to have an injury, don’t just hope the limp or tender spot will go-away on its own. A veterinarian should make a diagnosis as quickly as possible to avoid aggravating the damage.